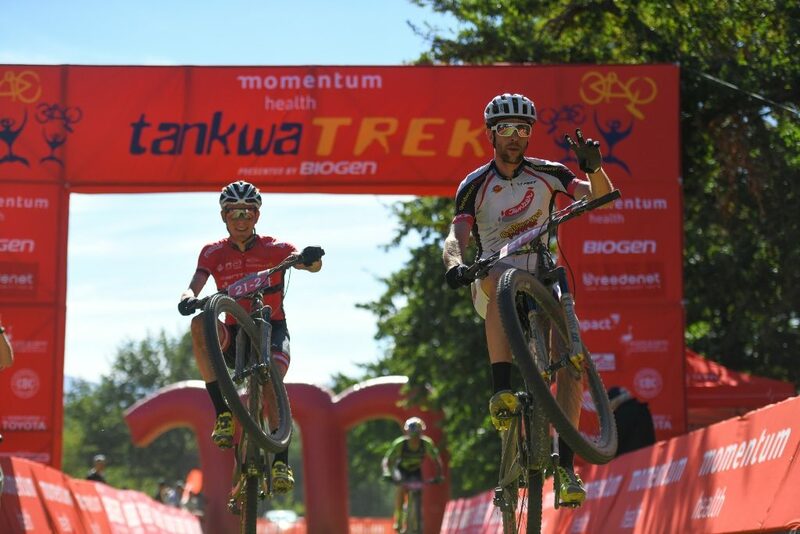 Stage winners Daniel Geismayr (left) & Nicola Rohrbach (right) celebrate their success on the final day of the Momentum Health Tankwa Trek, presented by Biogen. Photo by Zoon Cronje. The third and final stage of the Momentum Health Tankwa Trek, presented by Biogen, was won by Nicola Rohrbach and Daniel Geismayr (Centurion Vaude by Goldwurst Power), and Yolande de Villiers and Mariske Strauss (Silverback Volvo OMX); but despite a tense moment for the leading women neither the pink or yellow jerseys changed hands. No mountain biking fan can argue that dormakaba’s Candice Lill and Helen Grobert, and Canyon Topeak Factory Racing’s Alban Lakata and Kristian Hynek were deserved winners of the 2018 edition of the race. 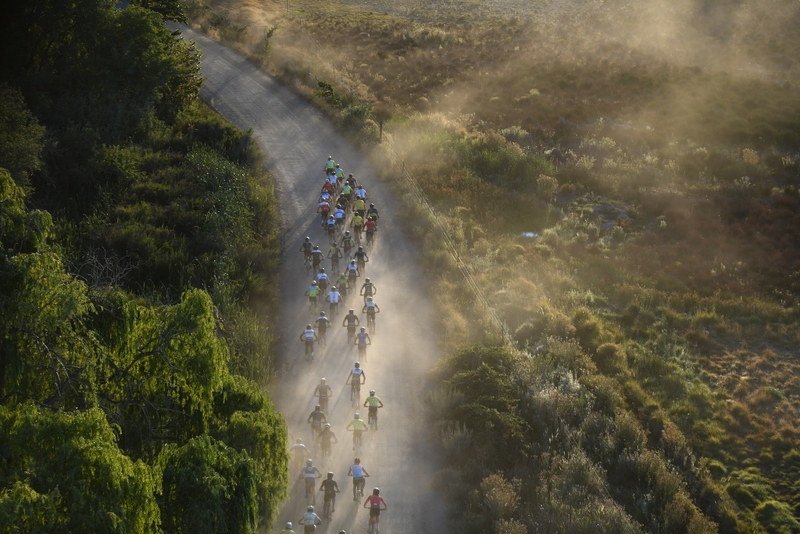 Stage 3 of the Tankwa Trek featured a rolling start which saw the entire field take to the district roads which separated the race village, Kaleo, from the superb Houdenbek singletracks. Once the Centurion Vaude by Goldwurst Power combination of Rohrbach and Geismayr reached the famed trails they virtually immediately went on the offensive. “I was a little behind and I moved up next to Nicola (Rohrbach). We attacked on the first two little climbs and then on the two hundred meter long climb we attacked again and started to open up a gap” Geismayr recounted. “My partners keep letting me down” Rohrbach joked, referring to Lukas Flückiger’s stomach bug last year and Geismayr’s series of punctures on Stage 2. “I think next year we come back with a full team, four riders and support staff. 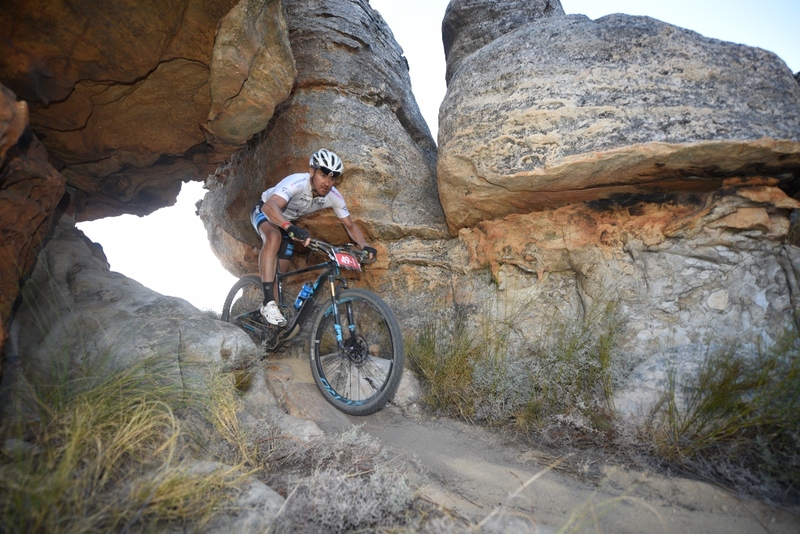 Then we try to win the Tankwa Trek” the powerful Swiss rider declared. Rohrbach and Geismayr went on to win the final stage of the race by soloing to victory from 40 kilometres out. They had only the out of category rider, Henrique Avancini for company – but as Avancini had dropped from the UCI Men’s field when his partner Manuel Fumic retired during Stage 2 he was unable to assist the leaders in any way. The moment at which Nicola Rohrbach & Daniel Geismayr made their decisive move. Photo by Zoon Cronje. Behind the eventual stage winners the final stage proved a tense affair. The leading group of general classification riders never dropped to below six teams. The only casualty on the stage was a significant one, with ramifications beyond the Momentum Health Tankwa Trek, presented by Biogen. 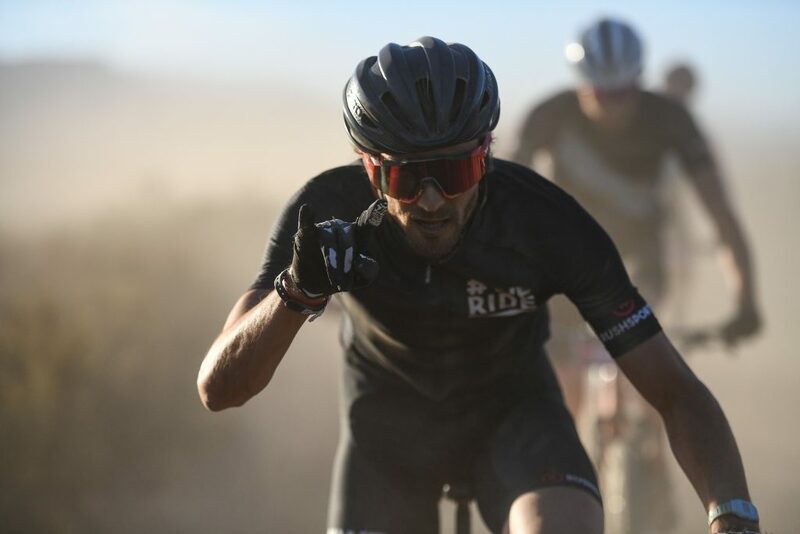 The seventh team in contention for second position on the stage and the fourth placed team going into the final stage, the Spur Specialized combination of Alan Hatherly and Simon Andreassen, were rocked by the South African cross-country champion crashing out of the race. Hatherly’s crash left him with a broken radius, in his wrist, and with just under a month to go before the UCI World Cup campaign kicks off in his home town of Stellenbosch the injury is even more unfortunate. 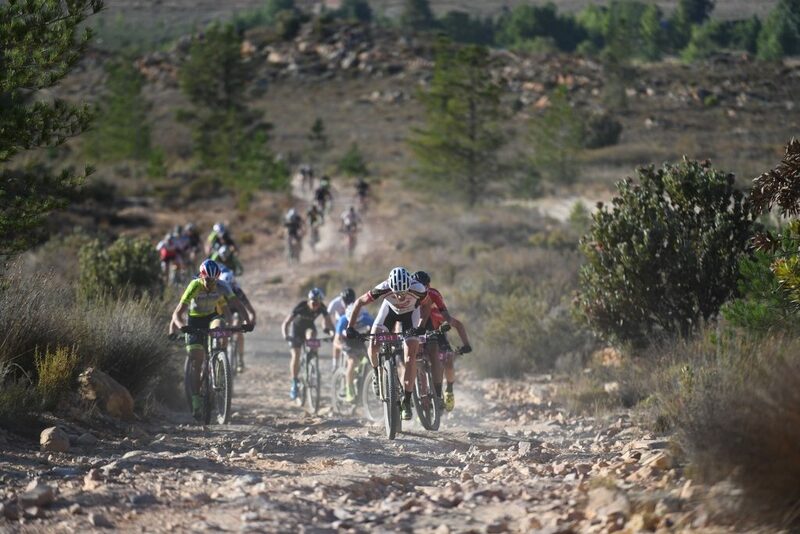 South African mountain biking fans had great hopes of Hatherly claiming the under 23 race victory at the Stellenbosch World Cup, but now the young star could well miss a significant part of the season. 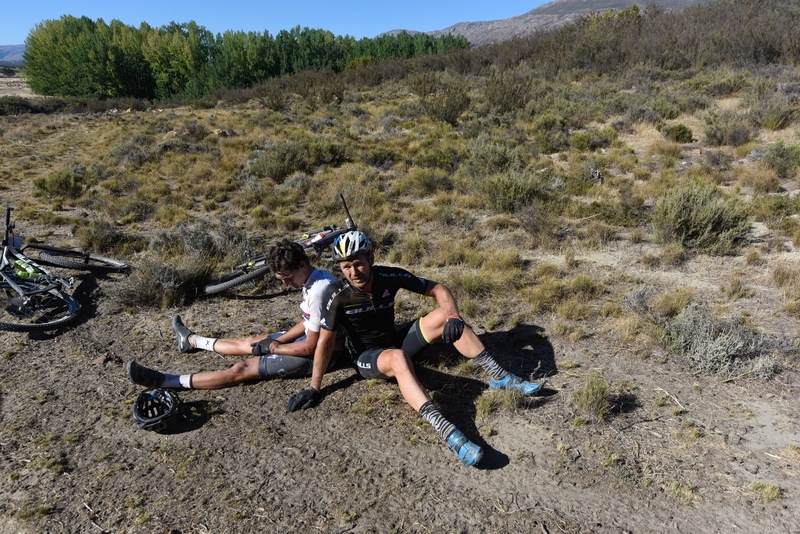 The Momentum Health Tankwa Trek, presented by Biogen, would thus like to wish both Alan Hatherly and Esther Süss, who crashed out on Stage 2, speedy and full recoveries. Karl Platt, proved once again why he is one of the best loved figures in the sport when he stopped to assist the injured Alan Hatherly. Photo by Zoon Cronje. The six remaining teams in the leading men’s group contested a chaotic sprint for second position, with PYGA Euro Steel’s Philip Buys and Matthys Beukes taking the honours. The third team across the line was the yellow jersey wearing Canyon Topeak pair of Alban Lakata and Kristian Hynek. “For sure it’s a big win for us” Hynek reflected after securing the general classification victory with the third place position. “But more importantly it is a sign that we are in a good way and working together well”. It takes a team to win a stage race. 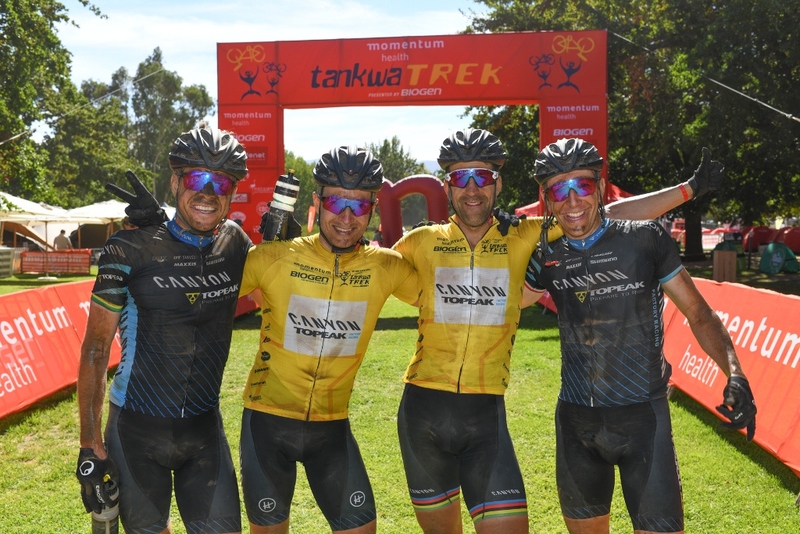 The Canyon Topeak Factory Racing team, from left to right: Erik Kleinhans, Kristian Hynek, Alban Lakata & Jeremiah Bishop. Photo by Zoon Cronje. 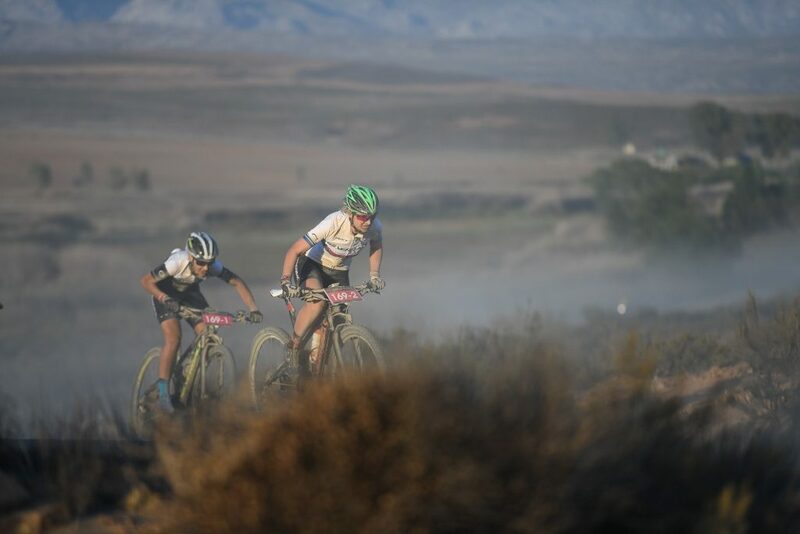 The women’s race saw the dormakaba team of Candice Lill and Helen Grobert suffer their first misfortune of the race, but despite taking longer than they would have liked to fix a puncture their overall lead was never truly in doubt. 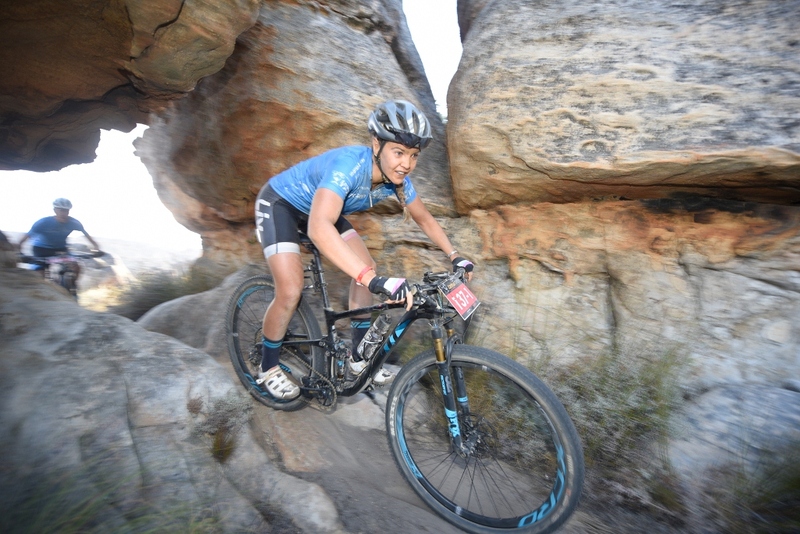 The Silverback Volvo OMX team had set the pace once the women entered the singletrack but Lill and Grobert did not appear to be in any discomfort as they tracked the third placed general classification team. 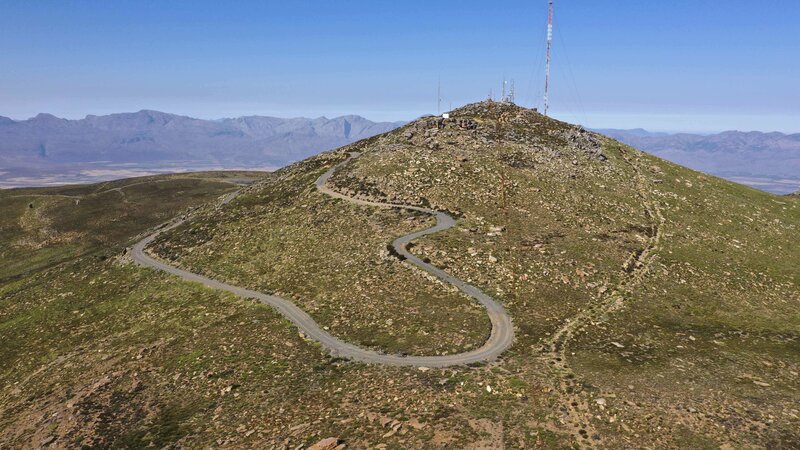 Ascendis Health’s Robyn de Groot and Sabine Spitz were slightly off the pace, but with a 12 minute buffer on De Villiers and Strauss they were at no risk of losing their second position overall. 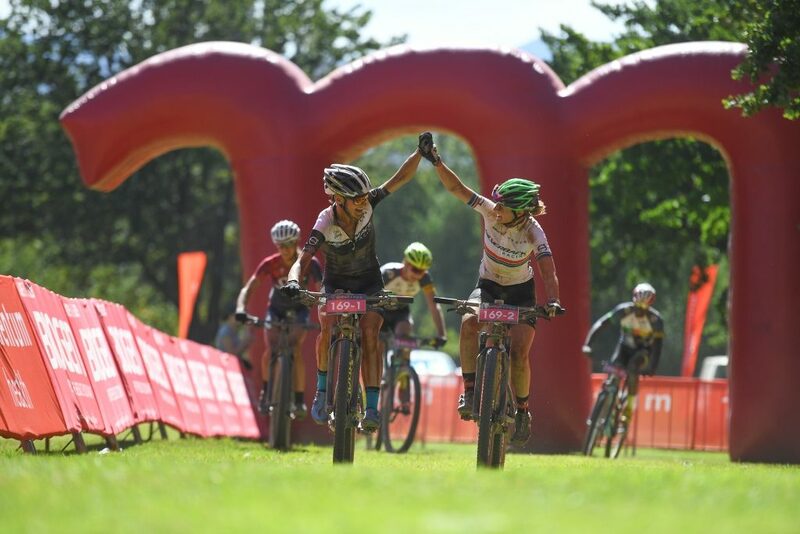 Yolande de Villers (left) and Mariske Strauss (right) celebrate their stage victory on the final stage of the 2018 Momentum Health Tankwa Trek, presented by Biogen Photo by Zoon Cronje. “I have fixed many punctures in my career before and they can be stressful in a racing situation, but it was definitely more stressful fixing a puncture in the leaders’ jersey in the final 15 kilometres of a stage race” Lill laughed. “I did not even see Ascendis go past us” she confessed. Grobert had seen the second placed general classification team pass them though and set the pace as the dormakaba women fought their way back to insight of De Groot and Spitz. 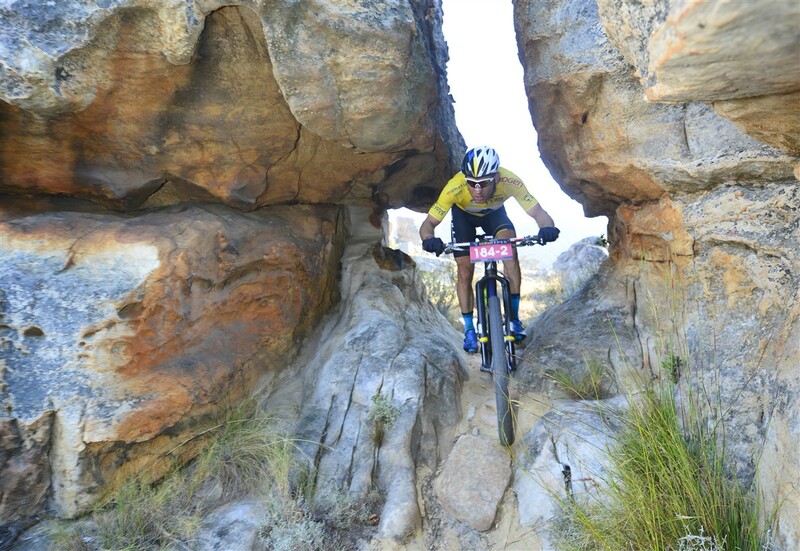 “Once I saw them as we were able to enter the last bit of singletrack I knew we had won” Grobert said. 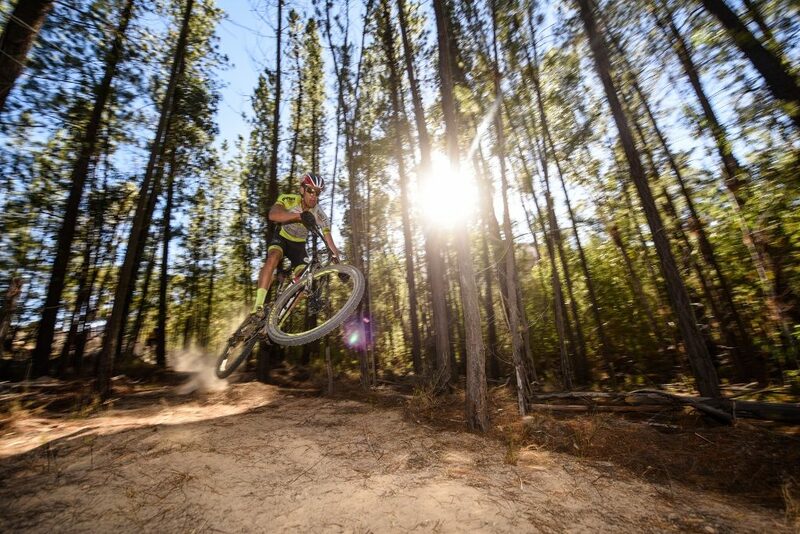 “We could just ride the trails with flow and have fun” the stage race rookie responded. Helen Grobert (left) and Candice Lill (right) spent the entire Momentum Health Tankwa Trek, presented by Biogen, racing with smiles on their faces; making them popular winners. Photo by Zoon Cronje. 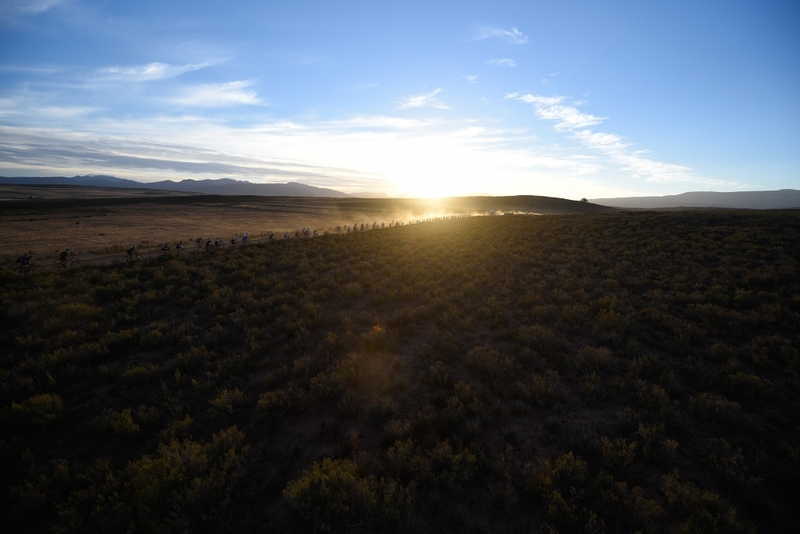 Thus concluded a memorable Momentum Health Tankwa Trek, presented by Biogen: with the crowning of two worthy winning teams; the 2018 women’s champion, the dominant dormakaba squad, and the men’s champions the tactically astute Canyon Topeak Factory Racing. The dust kicked up by nearly 600 mountain bikers makes for spectacular photos into the rising sun at the Momentum Health Tankwa Trek, presented by Biogen. Photo by Zoon Cronje. The men’s field endured a nervy day as much of the route was ridden in a sizable pack. Photo by Zoon Cronje. 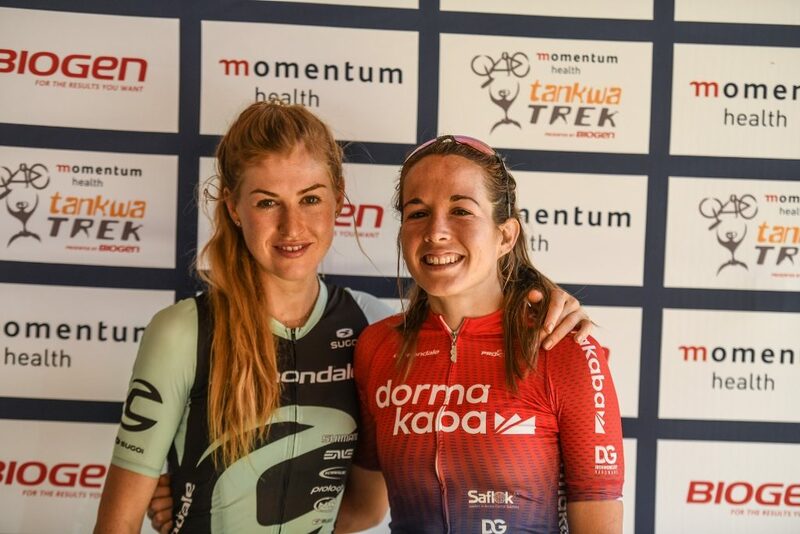 Yolande de Villiers (left) and Mariske Strauss (right) went on the attack in search of stage victory on the final stage of the Momentum Health Tankwa Trek, presented by Biogen. Photo by Zoon Cronje. Sarah Hill raced to victory in the mixed classification with Nicol Castens for Giant Liv South Africa. Photo by Zoon Cronje. Parting shot… Give it horns. Featuring Oliver Munnik. Photo by Zoon Cronje.